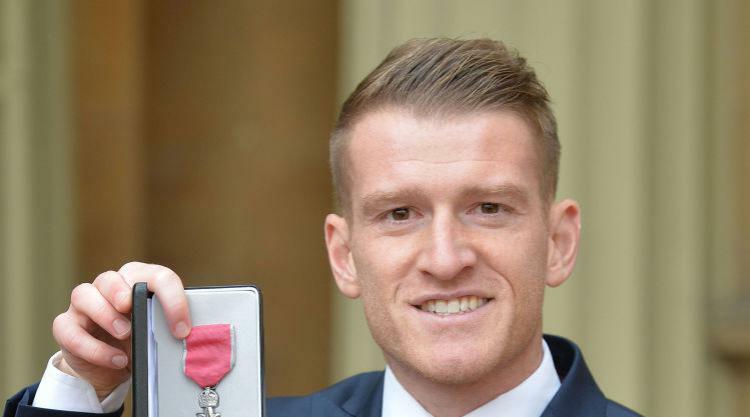 Southampton and Northern Ireland captain Steven Davis spoke of his honour after receiving his MBE at Buckingham Palace on Tuesday. Davis was presented with his medal by the Duke of Cambridge, who is president of the Football Association. The 32-year-old said it was an "honour that I will cherish" to be given an MBE at such a point in his career. He added: "I think to get it in any given field is huge, and obviously to still be playing as well, it's unbelievable. It's nothing I ever expected, to be honest." Speaking ahead of the two-legged tie against Switzerland next month that will determine if the Northern Irish reach the World Cup, Davis said: "It's going to be a difficult game but there's a lot of belief within the squad, and it's two games for us to get to the World Cup so we will be giving it our all." Davis said the proudest moment of his career so far had been playing in the 2016 European Championships for his country in France. He was joined at the Palace by former Wales international and current Cardiff City Ladies chairwoman Michele Adams, who said "playing and captaining my country" had been her career highlight. She said she enjoyed watching the young girls she had coached become professional players and have successful careers. She added that it was important to get girls of all abilities interested in sport, saying: "It builds team spirit and it builds a person's ability to feel comfortable in various places, and also it's good health-wise. " Adams was given an MBE for service to girls and women's football in Wales, while Davis was honoured for services to football.